Watson Machine Learning Accelerator, a new piece of Watson Machine Learning, makes deep learning and machine learning more accessible to your staff, and brings the benefits of AI into your business. It combines popular open source deep learning frameworks, efficient AI development tools, and accelerated IBM® Power Systems™ servers. Now your organization can deploy a fully optimized and supported AI platform that delivers blazing performance, proven dependability and resilience. 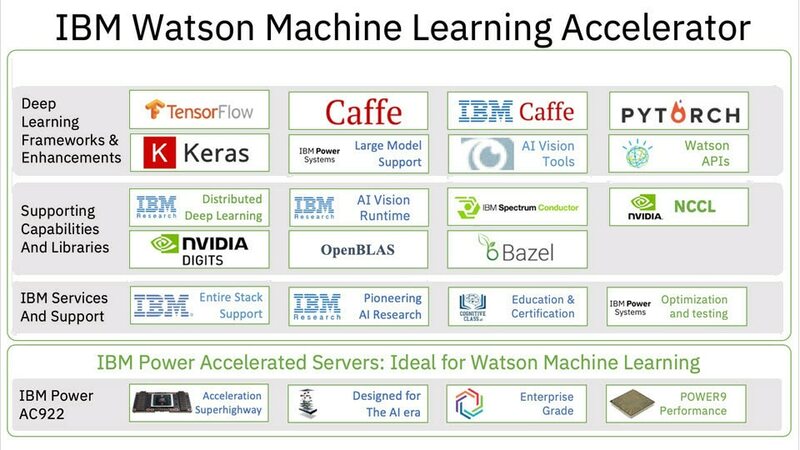 Watson Machine Learning Accelerator is a complete environment for data science as a service, enabling your organization to bring AI applications into production. Accelerate time to deploy deep learning workloads and get results quicker from initial prototype to enterprise-wide deployment. Exploit unique data architecture and turn deep learning performance into value with IBM Power Systems and other available hardware. Leverage Large Model Support and Distributed Deep Learning to support models at higher resolution, up to almost any scale. Expand your deep learning deployment to multiple users and lines of business with multi-tenancy and role-based access controls. Protect them with end-to-end security.